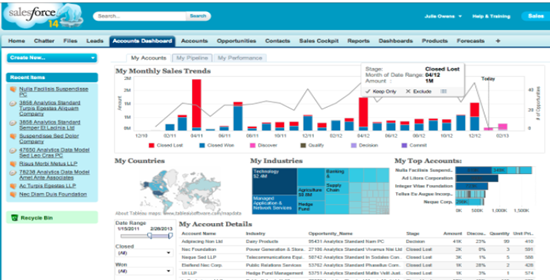 Turbocharge Salesforce – and your sales team – by inserting Tableau analytics directly into Salesforce dashboards. Our brains process visual data (think Tableau) better and faster than text-based data (think Salesforce). By integrating the two tools, sales gets an at-a-glance overview of their accounts and opportunities instead of being forced to scroll through text. And it saves time: no need to go outside SFDC to run a Tableau report. In this webinar recording we show you how to embed Tableau into Salesforce using the free SFDC Canvas and Tableau Sparkler adapters. Using https encryption, Canvas allows parameters to be securely passed back and forth so that Tableau vizzes are automatically customized to each account or opportunity. And the icing on the cake: these adapters are free! You may also be interested in our webinar recording to Learn how to Use Tableau to Get to the Gold Hidden in Salesforce. It shows how to use buried leading indicators to help your sales team make better time prioritizations and your execs to make better sales strategy decisions. Michael Weinhauer heads up the Tableau Practice at Senturus. Michael comes to us from Oracle, IBM and SAP, where he spent over 20 years in different roles acquiring a wealth of hands-on, practical BI and big data experience. Michael’s team is also responsible for the development of the Senturus Analytics Connector for Tableau, which lets Tableau use Cognos or MicroStrategy as a data source. What If You Want Both? Enter Sparkler! Analytics in the flow of the business process, at the point of impact! Do I Need Tableau Sparkler? Warning: do not COPY text, it will fail! Must be done via TABADMIN (don’t edit text file)! There are many ways to access Salesforce data from Tableau, each with its own benefits and drawbacks. Tableau Sparkler enables leveraging the power of Tableau visualizations directly in Salesforce, providing analytics within the flow of the business process, at the point of impact! Using Tableau with a combined data source allows organization to truly unlock the power of both applications! Installation of Sparkler is not straightforward or easy, but the benefits are significant!